Today is the Third Day and Third Shift of SSC CHSL 2018 Exam. This exam is scheduled to take place from 04th to 26th March 2018 and is being conducted in 03 Shifts (10 AM to 11 AM, 1.30 to 2.30 PM & 4.30 to 5.30 PM) each day. 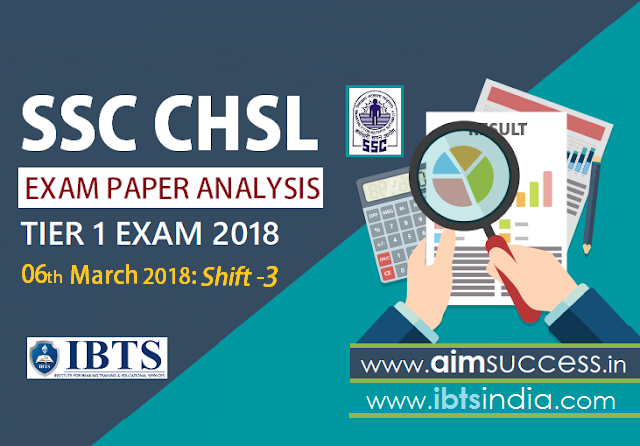 As the SSC CHSL Exam for 03rd Shift is over now, have a look at the SSC CHSL Tier-I Exam Analysis 6th March 2018: Shift - 02 and Know about the Good Attempts and Section-wise & Overall Difficulty Level of the exam to stratagize your exam preparation for coming SSC CHSL Exam. The overall level of this shift was EASY-MODERATE. The time duration of the exam is 01 hour i.e. 60 minutes. Reasoning section was too easy. In GK section, maximum questions Were Based on Current Affairs. In Reasoning Section, Number of Questions from Non-Verbal Reasoning was Less. This year SSC has introduced changes in the exam pattern by reducing overall exam timing from 75 minutes to 60 minutes. So, before moving forward, let us revise the SSC CHSL Exam Pattern. The SSC CHSL Tier - I Comprises Computer Based Test. In SSC CHSL Tier-1 Exam 2018, English language section was easy-Moderate, this time there were no RC(Reading Comprehension) instead there were 1 Cloze Test with 5 questions based on it and questions from it were of easy-moderate level. In SSC CHSL Tier-1 Exam 2018, General Intelligence(Reasoning) questions were of Easy level. There were only 1 questions from image. In SSC CHSL Tier-1 Exam 2018, General Awareness questions were asked from all aspects of GA, especially from Science section, if you have basic knowledge of Science, then you can easily score good marks in GA Section. In Current Affairs, 3-4 questions were asked. Questions were asked from constitution in polity. WHICH COUNTRY'S PRESIDENT GOT NOBEL PEACE PRIZE 2016? For Best SSC Coaching in Chandigarh Join IBTS Call Now..